AS EVER, the Wire & Gas Experts Forum provided the opportunity to hear from leading industry figures. Taking to the podium were Refrigerant Reclaim Australia general manager Michael Bennett, Refrigerants Australia executive director Greg Picker and Auto Skills Australia training package specialist Neil Hunichen. 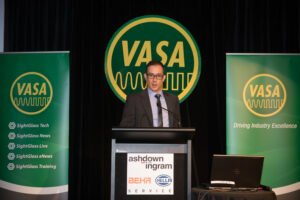 Australian Automotive Aftermarket Association membership development manager Nigel Bishop also delivered a presentation about the AAAA’s current activities and the benefits of its reciprocal relationship with VASA at the following night’s Gala Dinner. Mr Bennett’s presentation covered the link between world population and the amount of greenhouse gases in the atmosphere, the effect of the global financial crisis and Carbon Tax on the amount of refrigerant sent to RRA for safe destruction and the huge achievements made in Australia to prevent further ozone destruction and carbon dioxide equivalent emissions since RRA’s inception in 1993. 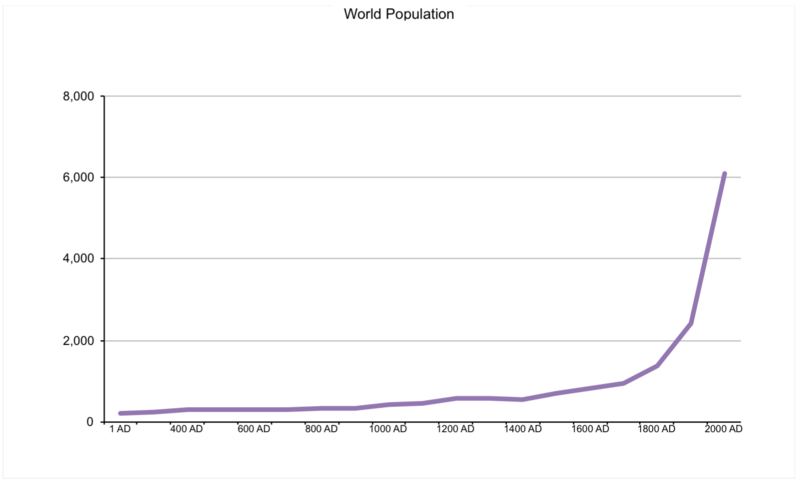 His presentation started with a graph of global population during the last 2000 years. Interestingly it declined between 1200 AD and 1400 AD, because of Genghis Khan, whose empire took out 40 million people or 10 per cent of the world’s population. “One person could make a real difference … the black death had something to do with it as well,” he joked. 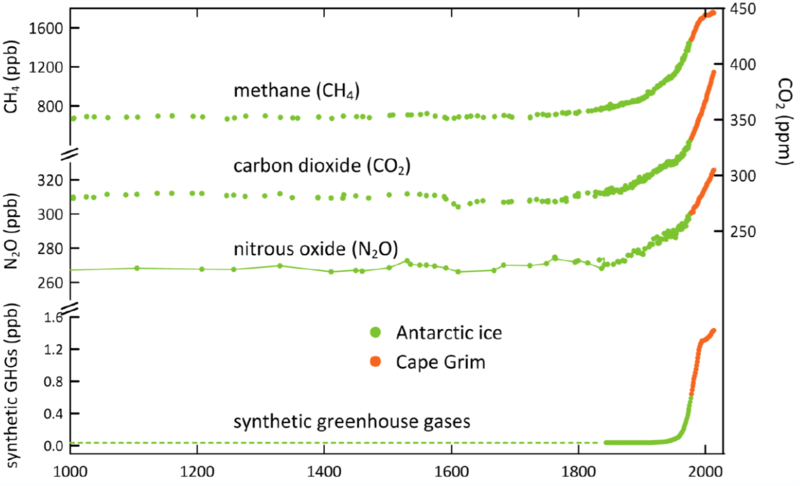 The next slide was a graph produced by the CSIRO showing levels of the three of the six major greenhouse gases in the world’s atmosphere during the same 2000-year timeframe. Of course, the big change to both population and greenhouse gases coincided with the industrial revolution of the early-mid 1800s when coal and oil started replacing wood as fuel. A 1000-year graph of synthetic greenhouse gases showed no sign of them in the atmosphere until much later, with another chart plotting the presence of R134a revealed a sharp increase in their presence from around the mid-1990s, to current levels of 80 parts per trillion. In other words, 200,000 tonnes of R134a is emitted to atmosphere every year, making it the largest volume of HFCs in the atmosphere. However Mr Bennett provided good news in the fact that during the CFC phase-out since 1995 the world has gone from more than 50 million tonnes of CO2-equivalent being emitted to less than 10 million tonnes, a reduction of more than 80 per cent. “The greatest contribution to reducing climate change in the world and indeed Australia has been the Montreal Protocol to save the ozone layer,” said Mr Bennett. He went on to show how R12, the biggest contributor to ozone depletion, with a graph of emissions since its invention in the 1930s and that 500,000 tonnes of R12 being emitted per year in the early 1990s because it was not just used as a refrigerant but also in aerosols. And the chlorine in it keeps damaging ozone for 100 years. There has been a 10 per cent reduction in atmospheric chlorine since the 1990s and the ozone layer is repairing. “It is repairing because of all the work industry all around the world – and in particular Australia – have done, so well done everybody,” said Mr Bennett. He then briefly plotted how much refrigerant had been collected for safe disposal by RRA each year since its inception in 1993 – and there were two blips on the graph. 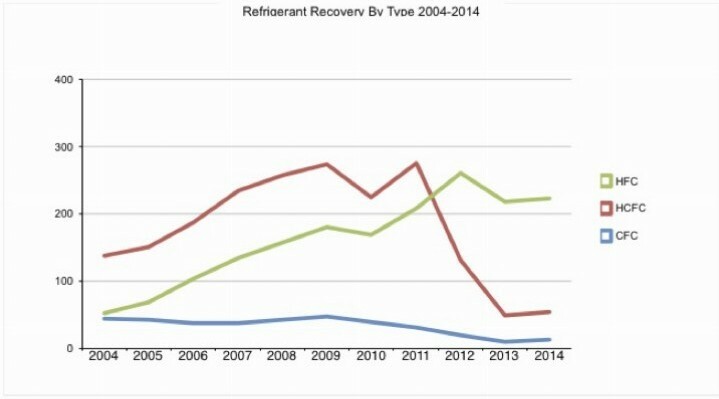 First, the global financial crisis reduced the rate of refrigerant recoveries, which slipped from the annual rate of 500 tonnes per year but soon rebounded once the economy improved again. But when the Carbon Tax came in and caused refrigerant prices to skyrocket, the data showed recovery plummet from more than 500 tonnes per year to around 200 tonnes per year as people avoided buying new refrigerant and reused what they had. 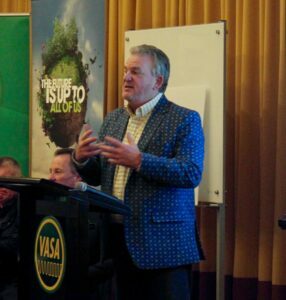 “If you want to kill a product stewardship program of refrigerant recovery, put a Carbon Tax in,” quipped Mr Bennett. Since Carbon Tax repeal, recoveries shot up from 220 tonnes to 320 tonnes in the past 12 months and will continue to grow. Since RRA was set up, more than 5000 tonnes have been recovered, meaning 10 million tonnes of stratospheric ozone has been saved from destruction and the equivalent of 10 million tonnes of carbon dioxide have not been emitted. “That’s just because people have done the right thing,” said Mr Bennett. May long doing the right thing continue, as more than 45,000 tonnes of refrigerant remains installed in equipment in Australia alone – including 10,000 tonnes of R134a in automotive systems on the road today. Segueing from Mr Bennett’s presentation, Greg Picker said the equivalent of 30 million tonnes of CO2 have been prevented from entering the atmosphere in a decade. He then put the 30 million tonnes into context – about half of one per cent of Australia’s total carbon dioxide emissions in one year from all human-controlled sources – but explained that it “makes our industry one of the most successful sectors in terms of what we have achieved to date”. “Considering we represent such a piddling percentage of emissions, 30 million tonnes is tribute to the fact that what we have done has worked,” said Dr Picker. Like Mr Bennett, Dr Picker referenced data from the Cape Grim baseline air pollution station in Tasmania, which showed a decline in Australian HFC emissions during the past three years. We can attribute this decline to better workmanship, tighter systems and refrigerant reuse and recovery. “We have evidence that what we are doing is making a difference,” said Dr Picker, who went on to compare Australia’s refrigerant reclaim systems favourably with other countries – especially for its “buy-in from an amazing percentage of industry across the board”. “Australia is running if not the best, one of the best refrigerant reclaim systems in the world, and that’s a tribute to everyone in this room,” said Dr Picker. 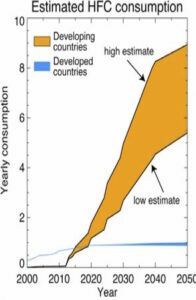 But patting ourselves on the back and doing a great job in Australia pales in comparison to what was represented by a graph in Dr Picker’s presentation showing the HFC consumption of developed nations compared with an estimate of consumption in developing nations between now and the year 2050. That solution is under discussion this year as part of talks to phase down HFCs under the Montreal Protocol that phased out ozone-depleting substances. Closer to home, Dr Picker provided an update about the Ozone legislation review currently taking place in Australia. coverage of all refrigerants under the licensing system and a ban on hydrocarbon retrofits. “I would love to say all these things will come to pass,” said Dr Picker, who assured the audience that these changes are in the mind of industry in general and in the mind of government as it reviews the legislation,” he said. 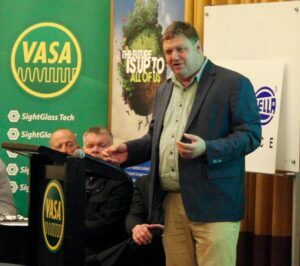 Neil Hunichen said he first engaged with VASA around three and a half years ago as a training package specialist, representing industry nationally in the fields of auto electrical, hybrid electric vehicles and air conditioning. In fact, it was air conditioning where he got his first induction to the state of the industry – when he realised that air conditioning units of competency looked as though they had been written some time ago and that and the technology and market has changed a lot since then. He worked closely with Michael Bennett, Greg Picker and government to develop the completely new Recover Vehicle Refrigerant elective unit. Mr Bishop has until end of August with ASA and Wire & Gas 2015 was possibly his last opportunity to engage with industry due to the new government model. “After August I will probably become a consultant and I will probably try and do the same kind of work because government wants to use the consultancy model,” he said. “I Wanted to thank VASA for valuable information he could not get knocking on doors and asking the OEMs. Be sure to read the latest edition of SightGlass News for more information about revisions to Automotive Air Conditioning Cert II qualifications. Nigel Bishop provided a history of the Choice of Repairer campaign, its success and the recent release of AAAA’s information sharing Code of Practice at the Aftermarket Expo in Melbourne following the Heads of Agreement signed in December 2014. He outlined the importance of keeping up this work as vehicle telematics becomes more commonplace and raises questions over aftermarket access to information stored and transmitted by telematics systems. 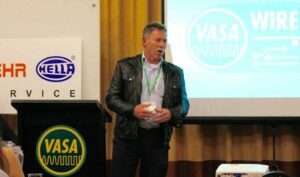 Moving onto the Australian Automotive Aftermarket Expo, at which VASA launched its new brand and suite of member benefits, Mr Bishop described the unprecedented government interest in this year’s event and the industry it represented, which led to a high level of media interest. He said feedback was that the Australian Expo now rivals overseas events in terms of quality. In conclusion, Mr Bishop explained the value of the mutual support between AAAA and VASA. 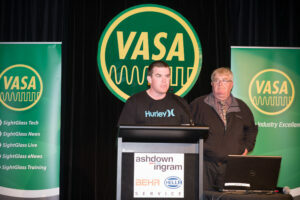 Victorian VASA members Dave Robson and Anthony Mugavin took to the podium at the Gala Dinner, delivering a touching message of thanks from the grass-roots membership to the dedicated volunteers running VASA.